People shouldn't eat farm-raised salmon more than once a month in most cases because the fish contain long-lived industrial chemicals that increase the risk of cancer, a major study concludes. Wild salmon carry lower levels of PCBs, dioxins and other contaminants but also could present a cancer risk if eaten too often, according to the study released yesterday, the most comprehensive examination of the issue to date. The scientists' findings were quickly assailed by fish farmers, state and federal government officials and nutrition experts. They faulted the study for focusing on long-term cancer risks while failing to take into account immediate benefits salmon provides for the circulatory system. Heart disease is the biggest killer of Americans. Turning to other protein sources such as beef, critics warned, likely would prove less healthy than continuing to eat salmon. Salmon raised in saltwater pens, which is priced much lower than its wild counterpart, is one of the fastest-growing segments of the food market. So the report being published today in the journal Science seems bound to perplex consumers who have been advised to increase their fish consumption. "We hope it does not turn people away from fish," said David Carpenter, a University at Albany, N.Y., researcher and co-author of the study. 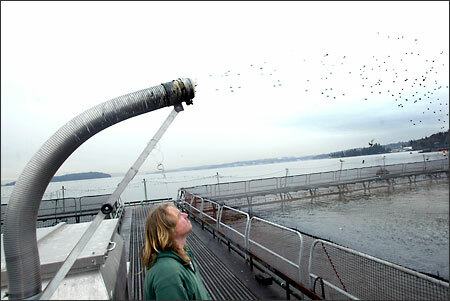 "We hope it turns people away from farmed salmon." The researchers tested more than two tons of salmon purchased from fish farms and supermarkets in Europe and North America, and from fishermen in Alaska and the Pacific Northwest. The most contaminated salmon came from fish farms in Europe, followed by those on Canada's eastern coast. Washington's handful of fish farms showed contamination on par with that of the massive industry in Chile -- the lowest levels measured, while British Columbia fish farms showed mixed results. Farmed fish, on average, showed a level of polychlorinated biphenyls, or PCBs, about seven times higher than that of wild fish. The average dioxin level in farm-raised salmon was 11 times higher than in wild salmon. The key difference is what the fish eat -- the same difference that prompted last year's controversy over artificial coloration of farmed salmon. Farmed fish are fed a mixture whose creation relies heavily on catching fish such as small anchovies, then processing them into fish oil and fish meal. This concentrates contaminants that have scattered across the globe. PCBs, a family of chemical compounds used in industrial lubricants and coolants, were banned in this country in the 1970s but still are used overseas. Wild salmon eat a variety of other fish, including tiny shrimp known as krill that give their flesh a reddish orange color. Farmed fish would be gray without artificial coloring. "This is a product that does contain great beneficial nutrients, but it also contains PCBs at levels that are expected to cause cancer in the population," said Jane Houlihan, an environmental engineer with the Environmental Working Group. "They know how to remove the PCBs from the feed and the fish." EWG's 2003 study of a handful of wild and farmed fish, which was not published in a scientific journal, reached conclusions similar to those in the broader study. Fish farmers say they are working to reduce the amount of PCBs and other contaminants in their product. "The fish-farming industry certainly has the opportunity and the motivation to move those levels down," said state Sen. Dan Swecker, R-Rochester, secretary-treasurer of the Washington Fish Growers Association. "We're saying, hey, pick a number, make it scientifically accurate and we'll hit it." The way the industry plans to do that is to genetically modify canola or soybean oils so they include more heart-healthy omega-3 fatty acids and use that to replace at least some of the fish oil in the pellets fed to farmed fish, said Charles Santerre, a Purdue University food toxicologist. Santerre, who recently became a consultant to Salmon of the Americas, a fish-farming trade group, criticized the study for pushing consumers toward sources of protein other than salmon. That could include beef, which has much lower PCB levels but poses other health problems and lacks omega-3, he said. It also could include other fish that are much higher in different contaminants, such as mercury. Studies show that about one in 12 American women have mercury levels higher than are considered safe, especially for a developing fetus, he said. "(The salmon study) was a good study. It was conducted by well-known scientists. The methods and experimental design were really solid," Santerre said. But "I believe their interpretation of the (results) is significantly lacking." Wild fish are not pollution-free, said the Science study, which was funded by the green-leaning Pew Charitable Trusts. For example, chinook salmon from southeast Alaska, prized because of their fat content, should not be eaten more than once a month, the authors concluded. And wild salmon in Puget Sound have shown PCB levels comparable to those that prompted the warning in today's study to limit salmon consumption. "The informed consumer needs to understand the benefits and risks of all foods," said Carpenter, the study co-author. The authors reached their conclusions by applying risk-assessment guidelines from the Environmental Protection Agency that are used to advise recreational anglers about how often they should eat their catch. But the EPA doesn't regulate commercial fish sales. That responsibility falls to the Food and Drug Administration. Carpenter said that while the EPA's methods are strictly health-based, Congress specifically requires the FDA to take economic impacts into effect. FDA's higher limits are "set so as to have minimal adverse economic impact and yet (they) don't ignore health effects, because they don't want fish that are dripping dioxins and PCBs," he said. The FDA tests salmon and other commonly eaten seafood for PCBs, pesticides and other contaminants three to four times a year in a program that tests everything from teething biscuits to coffee. The fish is tested from four areas nationwide. Farmed and wild salmon are not tested separately. PCB levels in fish have dropped significantly since the chemicals were banned, officials said. FDA data from 2001 showed PCB levels in salmon ranging from 20 to 30 parts per billion -- well within the agency's legal limits. FDA officials defended their limits as sound and were firm on their position that salmon eaten by U.S. consumers is safe. "There is not a public health concern here," said Terry Troxell, director of the FDA's Office of Plant and Dairy Foods and Beverages. "We don't think the public should be alarmed by these very low levels. Our advice to consumers is not to alter their consumption of wild or farmed salmon." Troxell emphasized that the low risk posed by the contaminants in the fish must be weighed against their nutritional benefits. "If anything we'd like to see consumers eating more fish," he said. State officials also criticized the study. "Fish are good for you. We want people to eat fish," said Rob Duff of the Washington Department of Health, acting director of the office of environmental health assessments. "We don't see that these levels (of contaminants) are very high compared with the benefits of the fish." Santerre compares the salmon quandary to the use of seat belts: Some people may die because of seat belts when they are trapped underwater or the car bursts into flame, he said. But, "what's the comparative risk of wearing your seat belt versus not wearing your seat belt?" he asked. "We understand there are some injuries that occur as a result of wearing them, but we still recommend wearing seat belts." Not eating fish is probably worse for you, he said. In his research in Indiana, Santerre found that 40 percent of low-income women of child-bearing age had not eaten fish in the last year. That's significant, because emerging research suggests omega-3 is important to the development of youngsters' brains. And while the study's authors say eating wild fish is preferable to eating farmed fish, those low-income women are unlikely to do so when wild fish goes for perhaps $10 to $20 a pound, while farmed fish sells in the neighborhood of $3 to $5 a pound, critics said. The researchers concluded that fish being sold in supermarkets should be labeled as farmed or wild. Further, they said, the label should say where the salmon were raised, so consumers can choose those from less-polluted regions. A federal law passed in 2002 requires supermarkets to label the country of origin of shellfish and fish and indicate whether they were farm-raised or harvested in open waters. That provision was part of a "country of origin" labeling law that applies to beef, pork, fish and fruits and vegetables. It was set to take effect Sept. 30, but a $328 billion catch-all appropriations measure before the Senate this month includes a provision that delays the mandatory labeling program by two years for all foods, except farm-raised catfish and Alaskan salmon products.